All "red" layflat hoses on the market are not the same. 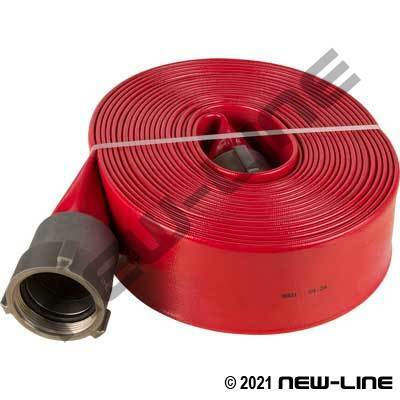 The NL2425 Red PVC Spiraflex has a thicker wall (for added durability) and a higher working pressure than other "red" PVC discharge hoses commonly seen on construction sites or rental yards (NOT for use with air and not for food grade applications). It is used for pump discharge in irrigation, construction, flood protection, and other standard pump applications. It is lightweight, mildew and rot resistant, and has a flame resistant cover that meets MSHA 2G-14C/16 approval. We do not recommend using layflat style hoses for general washdown, as it will not withstand excessive abrasion, dragging, or abuse. Typical Fittings: Camlocks, short shanks, forestry or threaded fire hose expansion ends, punch clamps.